Swarco Raiders brought a big win back to Tyrol over AFC Rangers - 42-17 (14-7; 7-10; 7-0; 14-0). 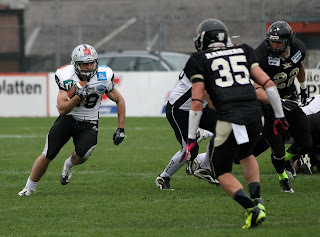 On Sunday the SWARCO Raiders will play the re-scheduled game at the Prague Black Panthers. Kickoff on April 28 at Prague’s Slavia Stadium is at 3:00 a.m. PT (12:00 p.m. CET).